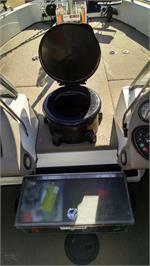 8" Tall Portable Toilet with removable bucket inside under the snap on lid. Very strong, molded non-tip base. Small profile allows it to be used discreetly and stored away easily. For year round use, the Good To Go with removable Optional Base Accessory increases the height to a comfortable height. Use at the hunting camp, while tent camping, while ice fishing in the ice house, etc. with the Optional Base.